Last May 22, a friend Joe Real, posted this in his fb wall, praising the automakers and attacking Trump about climate change. Joe is the older brother of my classmate in high school in Cadiz City, Negros Occidental. He is among the bright boys our city has produced because he went to Philippine Science High School, then UPLB, Agri Engineering. He has lived in California for many years now. Joe, Pls show (1) of the recent CC say the past 200 years, how much is nature-made vs man-made? Proof? (2) Medieval warm period, how much was nature-made vs man-made? Proof? (3) Roman warm period, how much was nature-made vs man-made? Proof? No numbers means crystal ball hula-hula, hahaha. Then I re-read his comments and realized that it was full of unsubstantiated claims and personal attacks, of deep-seated intolerance at being questioned of his belief. (1) "climatic changes which is very rapid compared to any other geological times" -- where are the proof of this? rapid by how much, 2x, 50x, 100x? Proof and links? say compared with the Medieval warm periodA? Roman warm period? (3) "I am writing this in hope that your future children or your future relatives will vilify what you’re doing." -- my children enjoy riding an airplane that uses fossil fuels. If I make them ride giant kites or giant brooms to fly to Negros or Iloilo, they will vilify and hate me. Now look at yourself and your lifestyle -- you post your travels to far away places, meaning you did not ride giant kites but giant airplanes that use fossil fuels, then you hate fossil fuels. That's 101% hypocrisy double talk, Joe. (4) "you don’t have any credentials to show, so you only have an opinion that’s worth nothing much except create some noise." -- horrible, if one cannot confront the issues and counter-arguments, just do endless personal attacks. (1) of the recent CC say the past 200 years, how much is nature-made vs man-made? Proof? I did not realize that his intolerance at being questioned is so deep, so wild. He will make fictitious claims like "fossil fuels as your livelihood", I think only highly emotional and intolerant minds would make up stories like that. I like fossil fuels not because I earn money from those companies. Never worked for any of them in the past and the present, not even part time or consulting work. I like fossil fuels because they gave humanity modern and more convenient lives. I drive a car that uses gasoline; I ride airplanes that use aviation turbo; we cook in the house on LPG, not on firewood or charcoal/biomass; we have 24/7 electricity and internet mainly because of coal, natural gas and oil-based peaking plants, all fossil fuels. Without fossil fuels, life will be horribly dark, inconvenient and backward. Joe's intolerance and emotionalism like Al Gore-UN-CCC-WWF-others are based on voodoo science. 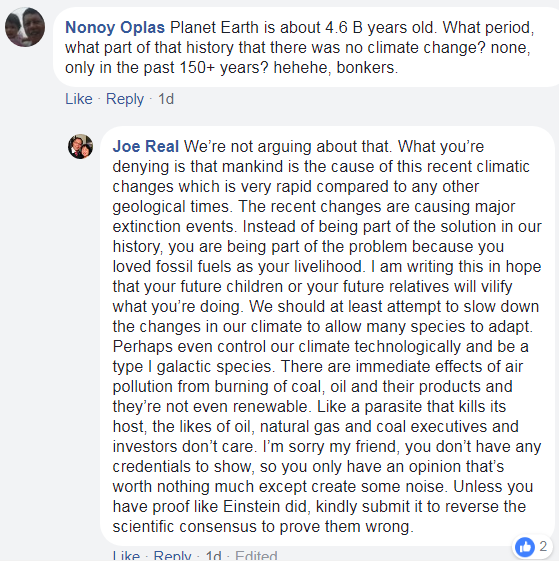 Joe Real To prove that the current change in climate is mainly due to man, you have to clear all doubts that natural climate variability is smaller than human caused forcing. Unfortunately, as I have been arguing across different fora, the records we have is too short and too sparse to draw any conclusions from. But of course you would ignore that since you've been an AGW believer from the get go. Open your mind and use critical thinking. Use your statistical skills and not rely on conclusions from other scientists. Their own data will belie what they conclude. Also the argument that the current warming is faster than at any time in history is a phenomena related to the way granularity of data decreases as you average it out over greater time periods. A good example is the daily swings in temperature is much greater than monthly swings in temperature. And monthly swings in temperature is much greater than annual swings in temperature. This is true in years vs decades, decades vs centuries and so forth. Since current era records are measured in months and years which is being compared to proxy temperature records that are averages over larger periods of time, the fallacy crops up that the current warming is faster than at any time in history. But a quick way to falsify this notion is to look at the first half of the 20th century vs the 2nd half. Both periods shows a sharp increase in global temperature. From 1900 to 1940 the slope of the temperature rise is almost the same as for the period of 1970 to 2000. But while AGW theory blames the 1970 - 2000 rise to humans, they cannot attribute the same to the rate of increase in the early 20th century. Therefore, to blame nature for the first and to blame humans for the second is incongruent to the way science works.